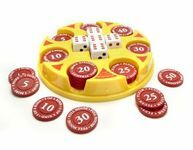 Let the five dice fly to achieve the best scoring combination and win the corresponding chip. There are only 4 chips of each kind. Grab the best ones before they run out!